Obermeyer makes both skiing and style a priority in presenting the Harlow Insulated Ski Pant. Designed for the skier who refuses to look second best, the pant features flowing curves and thoughtful aesthetics. Faux leather trim, metal-look zippers, and heavyweight topstitching complement the HyrdoBlock® Sport fabric to give the pant a personality of its own. Of course, the Harlow wasn't made to sit and look cute. Its 10K waterproofing and warming 60g insulation neutralize the cold, wet weather outside. Water-resistant powder cuffs and Skier Critical™ seam sealing seal things at the edges to ensure dryness. The comfortable, fleece-lined waistband adjusts to create the proper fit. Wear this pant while making your tracks in the snow and don't feel uncomfortable keeping them on after. "Do these pants run small or large in their sizing"
"Obermeyer products typically run true to size. We hope this information helps." "Do these pants have a zipper at the bottom?" "Thank you for your inquiry. Yes, the Obermeyer Harlow Insulated Ski Pant does have zippers at the bottom of the pant. We hope this information helps!" "How much allowance is there on the adjustable waist to expand?" "Thank you for your inquiry. The "Obermeyer Harlow Insulated Ski Pant (Women's)" is designed to fit around the hips (below the belly button), not around the waist. It is adjustable from 1" - 1 1/2". We hope this information helps with your Peter Glenn selection and purchase." "What is the rise on this in inches?" "Thank you for your inquiry. 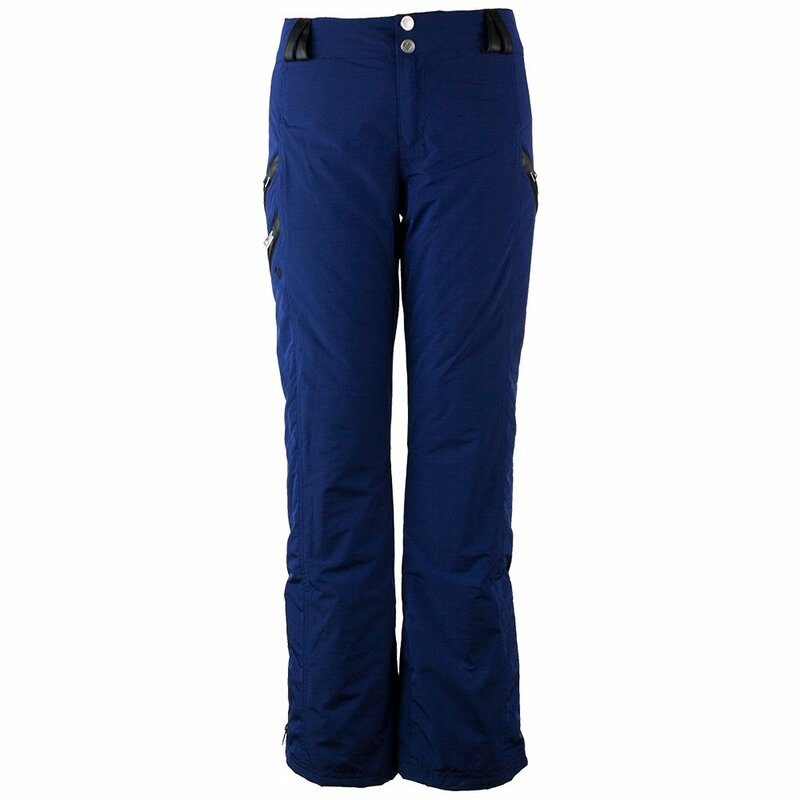 The "Obermeyer Harlow Insulated Ski Pant (Women's)" is designed to fit around the hips (below the belly button). We hope this information helps with your Peter Glenn selection and purchase." "What is the difference in length between two sizes? I fit better in a 2, but I think I might want the 4 for length? Are the two different sizes the same length in the regular fit?" "Thank you for your inquiry. The Obermeyer Harlow Insulated Ski Pant comes in different inseam lengths regular and petite. Regular pant inseam is between 29" to 32" long and is recommended to those between 5'4" to 5'7" tall and petite pant inseam is between 27" to 30" long and is recommended to those between 4'10" to 5'4" tall. We hope this information helps! " "How well would the black fabric of this pant match the Hydroblock fabric that the Cosima Obermeyer black jacket is made of? " "Thank you for your inquiry. The Obermeyer Harlow Insulated Ski Pant are black and the Obermeyer Cosima Down Ski Jacket is Ebony, they will not be an exact match in color. We hope this information helps! " "Will the resort at midnight pant match the blue of Karbon’s Pascal jacket in arctic white/blue?" "Thank you for your inquiry. The Karbon Pascal Ski Jacket and Obermeyer Harlow Insulated Ski Pant are different shades of blue, so it would be a personal preference. Customer also bought the Descente Marley Ski Pant with the Karbon Pascal Ski Jacket. We hope this information helps! " "Is the background color black or navy blue in the Pinks in Posey pattern? " "Thank you for your inquiry. The Obermeyer Harlow Insulated Ski Pant color "Pinks in Posy Print" has a black background. We hope this information helps! " "What is the inseam length difference between short and petite options?" "Thank you for your inquiry. Regular pant inseam is between 29" to 32" long and is recommended to those between 5'4" to 5'7" tall and Petite pant inseam is between 27" to 30" long and is recommended to those between 4'10" to 5'4" tall. We hope this information helps! " "do you have the Obermeyer insulated pant in size 8 regular in the cheetah print?" "Thank you for your inquiry. According to our current inventory, we have 1 pair left of the size 8, color: Leopard in reg inseam. We hope this information helps!"